Even scarier is that Castillo seemingly has no conceptual plan for the defense… Washburn runs the defensive front autonomously, and Castillo’s going to plan the back seven to “complement” his ideas? That doesn’t sound like a defensive coordinator with a coherent plan… At the end of the day, Reid couldn’t justify this decision with Castillo’s experience or knowledge or preparation. He had to fall back on “desire” and even an outlandish connection to the risk other people took when promoting Reid himself (under much more logical circumstances). The best explanation I can come up with nine months later doesn’t actually have much to do with Castillo himself, but rather his predecessor Sean McDermott. To start, I don’t think Reid is particularly partisan when it comes to defensive schemes. He was happy to bring Jim Johnson and let him run his blitz-happy system, although if Johnson was a Cover Two guy, it might not have made much difference. Reid has always been an offensive coach, and making sure he had a defensive coordinator who could pick a successful system and run it without help must have been the goal. 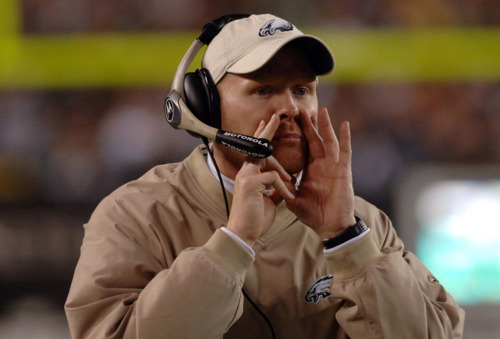 Not only did the Eagles not have the time to conduct a full coordinator search, Reid was hoping that McDermott could keep everything going in such a way that the head coach wouldn’t have to worry about things on that side of the ball. Obviously it didn’t work out. But what problems did McDermott have that Reid felt he couldn’t ignore? The first was tactical. McDermott’s schemes were often overly complicated. His “wrinkles,” like frequently dropping Trent Cole back into a zone or having a linebacker race across the defense to cover a tight end or running back, hurt more than they helped. Complicated schemes made the players seem a step slow. McDermott also lost the respect of the players in the locker room. Reporters started to hear off-the-record bad mouthing of the coach that never would have happened during Johnson’s time. As Sam Lynch noted, Reid’s course correction away from the McDermott errors may have been the right move in theory. But, clearly, Castillo’s promotion took the idea at least a a few steps too far. Tagged with Philadelphia Eagles, NFL, Juan Castillo, Sean McDermott, Defense, Defensive Coordinator, Andy Reid, Jim Johnson, Scheme, Leadership. October 6, 2011 by Brian Solomon.